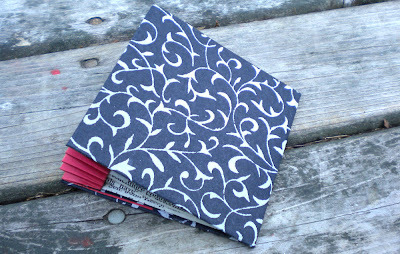 Finally, from Anna of PurpleBeanBindery, this is the last flag book from our recent swap. 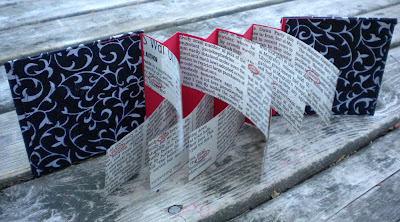 Definitely black and white and re(a)d all over, with the black and white print on the covers and red spine, Anna has used newspaper clippings with selected text (circled in red) for her flags. 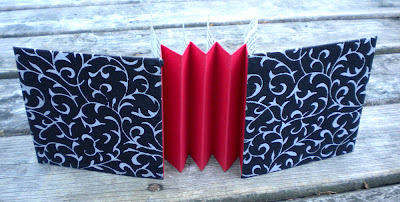 Check our Anna's work at PurpleBeanBindery.Etsy.com. I received it yesterday; i love it, it's fantastic, so special! This color scheme is great! Do the circled words make a sentence? I was wondering the same thing as Monica. Another fabulous flag book!